DESPITE THE RECENT snows, spring will soon be here. With the arrival of spring, the plants will be waking from a winter’s sleep ready to bloom and reproduce. Of course, being plants they will need a bit of help with pollination. With the advent of spring, bees and other insects will hatch or awaken from dormancy to do their jobs. We are all familiar with the importance of honeybees as pollinators – our agriculture industry would collapse without them. However, honeybees are not the only insects that pollinate plants. 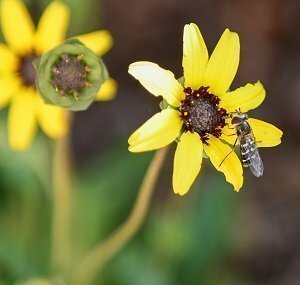 Native bees are also effective pollinators, as are wasps, flies, beetles, ants, and even mosquitoes! Not all plants rely on insects though and many plants have alternate ways of making sure that they get pollinated. 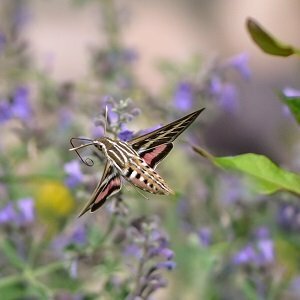 Plants use different strategies to attract different kinds of pollinators. One strategy is color. Most flowers are brightly colored and their petals are often arranged or shaded to provide a target for an insect to land on. Some birds, like hummingbirds, are also attracted to bright colors. Hummingbirds love red and purple tubular-shaped flowers. 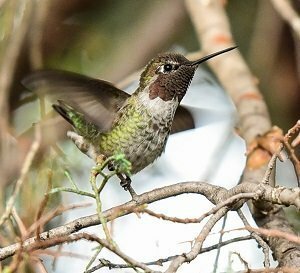 In fact, hummers evolved alongside their favorite flowers penstemons, honeysuckle, and columbine. This is visible in how well the flower shape fits their narrow beaks. White, night blooming flowers are pollinated by moths and bats. Bats are well-known for eating a lot of insects, but many species also eat flower nectar, gathering pollen in the process. 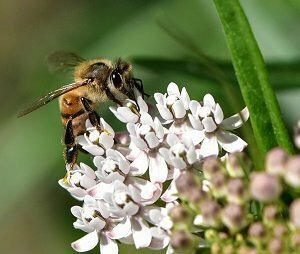 Another plant strategy to encourage pollination is odor. Many insects and animals are attracted by what most of us would consider offensive odors. Flies and beetles come to mind, but mammals do too, and upon encountering a nasty-smelling plant will lie on it and roll around. This transfers the odor and pollen to themselves. They do this mainly to disguise their own scent, not realizing that they are also helping the plants. Almost any mammal can be an unwitting pollinator, including humans, but there are two non-animal pollinators that have not been discussed: water and wind. Some water plants, like a lotus, living in riparian areas use the water to transport their pollen, and later their seeds, over long distances. The pollen drops into the water and may be carried many miles downstream to fertilize a far-away plant. Wind pollination works the same way. Some wind-carried pollen has been carried hundreds of miles! Have you ever wondered why oak trees remain green all winter, only to lose their leaves and look dead in the spring? Removal of the leaves makes it easier for the wind to pick up the pollen from the tiny oak tree flowers and carry it to another tree. Isn’t nature amazing? When the snow has melted, we can observe that plants are already beginning to prepare for spring. Even now, in January, some of the native plants have new leaves growing at their bases. Others have leaves that will remain green, and new leaf buds will soon be swelling on deciduous trees and shrubs. Look Closely! There is much to see.